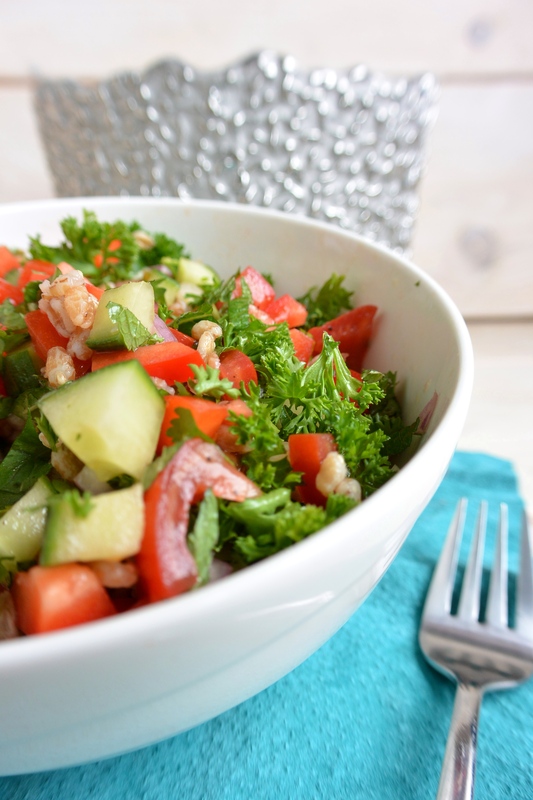 Tabouleh is a Libanese salad from origin. A Tabouleh usually consists of bulgur, chopped tomatoes, onions and fresh herbs, with a dressing of olive oil and lemon juice. Today I made this variation to the Tabouleh salad with Farro! Farro is a grain, similar to spelt . There is some debate about is real origin but we don’t mind, right? The taste is somewhat ‘nutty’ and the grains are quite big with a little bite. But all the sources agree that it’s an ancient type of grain and it’s said to have a higher nutritional value than the more common used wheat. I tweaked the ratio Farro:Veggies a bit, so this dish contains lots of vegetables and fresh herbs en less farro than you might expect for a tabouleh. But I like veggies and they’re good for you! 🙂 I really recommend to used the fresh herbs in this salad because that’s what gives so much yummy flavours to it! Boil the Farro in 1 cup of water for 10 minutes (or as mentioned on the package if that differs from the 10 minutes I mentioned). Mix the olive oil with the garlic, lemon juice and some salt and pepper. Add the chopped sjalot, mix and set aside. Chop all the veggies and herbs and add these to a bowl. When the Farro is done, drain and rinse under some cold water to cool it down. Add to the veggies and herbs and mix well. Add the dressing and mix again. Posted in Diner, Lunch, recipes, Salad, VeganTagged dairyfree, dinner, fit, food, healthy, healthy lifestyle, herbs, lifestyle, lunch, natural, recipe, salad, soyfree, sugarfree, suikervrij, vegan, vegetable, vegetables, vegetarian, veggie, veggies, zuivelvrijBookmark the permalink.